Strong winds from thunderstorms, tornadoes and other severe weather often uproot and topple trees. After major storms, the snarling sound of chainsaws can be heard throughout the neighborhood as emergency workers and homeowners cut up downed trees. Homeowners may think an uprooted tree can simply be pulled back upright, but that's not the case. The prospects for saving an uprooted tree typically depend on its size. If winds have uprooted a large old tree, the tree generally can't be saved and removal is your only option. Righting a large toppled tree would require a crane or other heavy equipment to lift the tree. Even if you successfully right the tree, it would still present a toppling hazard because of the damage done to the anchoring root system that holds the tree upright. Big trees rarely survive after being righted because of the loss of roots that nourish the tree. Smaller trees may be righted and saved if most of the roots remain unexposed in the soil. First, cover the exposed roots right away to keep them from drying out. Then dig out the soil beneath the exposed root mass and cut off the protruding shattered roots to allow the tree to be returned to the vertical position. Use a lifting machine, winch or lifting tackle to pull the tree back into place. Then fill in the area around the damaged roots with soil, and water thoroughly to eliminate air pockets and settle the soil. Prune off cracked or broken branches. Support the tree by driving three stakes or deadman anchors into firm ground around the tree and use guy wires to tie the trunk to the anchors. Spread mulch around the trunk to preserve soil moisture and check the tree for stability each year. Strong winds topple trees that don't have a healthy, well-developed root system to anchor them in place. Contrary to popular belief, most tree species don't have big deep tap roots directly beneath the trunk. Instead, trees have shallow anchor roots radiating out from the trunk. The anchor root system consists of perennial woody roots that grow out horizontally in the top foot of soil, and perennial vertical anchor roots descending a couple feet or more into the soil from the horizontal roots. Short feeder roots grow out from the perennial anchoring roots to collect water and nutrients for the tree. The root system radiates out from the tree for a distance about equal to the tree's height. 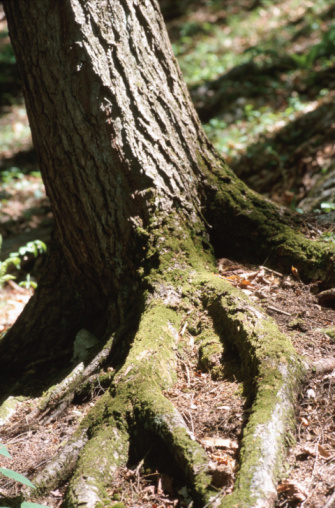 To provide solid anchorage for a large long-lived tree, the root system must be distributed evenly around the tree and be free of structurally weak areas. Wind-thrown trees are believed to be the result of poorly distributed roots from soil or climactic factors that restricted root growth on one side or another, or inadequately developed root systems because of generally poor growing conditions. Can Tree Roots Damage Your House Foundation?